The engine camshaft rotation is synchronised with the crankshaft. The engine computer (ECM) constantly receives the signal from the crankshaft position sensor (CKP) that is compared to the signal from the camshaft position sensor (CMP). The trouble code P0341 is set when the camshaft position sensor (CMP) signal is out of expected range or if it is not timed properly with the crankshaft position sensor (CKP) signal. - electrical interference from the secondary ignition system components to the CMP sensor circuit caused by high resistance in the ignition wires or spark plugs or faulty secondary ignition components. An Acura service bulletin describes an issue where the stuck or contaminated VTC control solenoid valve can cause the trouble code P0341. The bulletin recommends updating the ECM software and replacing the VTC solenoid valve if necessary. A service bulletin for the 2003 V6 Jaguar models mentions checking the resistance of the spark plug and replacing the spark plug along with the coil if the spark plug's resistance is too low. A technical service bulletin (TSB) for late 90's Saturn vehicles describes a problem where incorrect resistance in the ignition wires and secondary ignition system can cause the DTC P0341. A Chrysler TSB for 2010 Ram pickup trucks equipped with a Cummins diesel engine recommends re-flashing the ECM for the P0341 and some other trouble codes. In some 4-cylinder 2003-2010 Honda Accord, Civic, CR-V and Element engines, a stretched timing chain can cause the Check Engine light (MIL) to come on with code P0341. The camshaft position sensor connector and the wiring must be checked for damage, poor connection or corrosion. If it's a three-wire sensor, check for 5V reference voltage and the ground at the sensor connector with the ignition ON. The proper camshaft timing must be verified; if a timing belt or chain jumped a tooth, it can cause this code. A stretched timing chain can also cause the code P0341. Symptoms of a stretched timing chain include rattling noise, lack of power on acceleration, hard starting. There are different way to check if the timing chain is stretched: for example, Honda has a special tool; in some other cars, the signal from the camshaft position sensor must be compared on the oscilloscope to the crankshaft position sensor signal. If the tune-up hasn't been done in a long time, it's a good way to start, as the high resistance in the spark plugs and ignition wires can cause electrical interference from ignition secondary circuits that can cause spikes in the camshaft sensor signal. The routing of the camshaft position sensor wiring needs to checked, as If the camshaft sensor signal wires are routed too close to the secondary ignition components, there also could be an electrical interference. The proper operation of the variable valve timing system also must be checked. 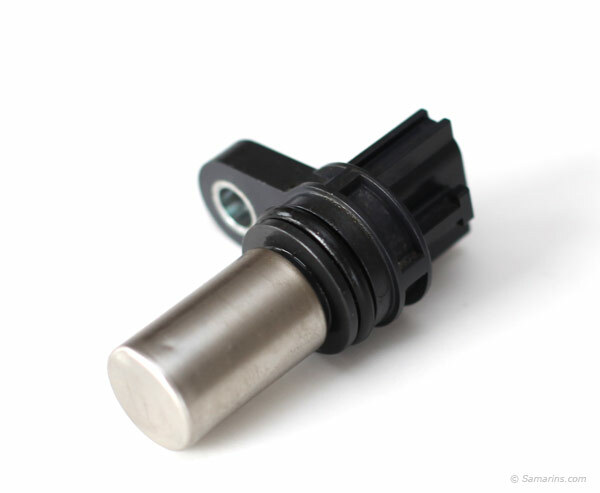 The camshaft position sensor (CMP) monitors the position of the camshaft or camshafts. 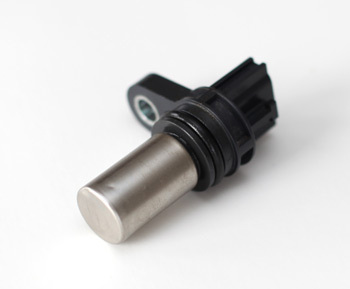 In an OHV (pushrod) engine, the CMP sensor is installed into the cylinder block. In a modern DOHC engine, one or two camshaft position sensors are installed at the cylinder head. A CMP sensor could be a two-wire pick-up coil type or three-wire Hall effect sensor. A pick-up coil sensor generates an electric signal, while the Hall effect camshaft sensor needs a 5V reference voltage. Modern OBDII cars mostly use a three-wire Hall effect camshaft position sensors. The engine computer (ECM) uses the signal from the camshaft position sensor to know which cylinder is in the compression stroke, as well as to control the ignition timing, fuel injection and the variable valve timing system (if equipped). Q: 2001 1.8L Volkswagen Passat turbo. Some gaskets and seals and the timing belt has been replaced, but now I got the code P0341 and the engine is hard to start. What could be the problem? A: Double check the timing between the crankshaft and the driven camshaft at the timing belt, as well as the timing between two camshafts, as the chain that runs between the camshafts can easily jump a tooth and this will be enough to set the P0341 code. Q: 1999 Chevrolet Malibu 3.1L V6 misfires and runs poorly. The parts store scanned the computer and there was a code P0341. Is it an expensive to repair problem? Where do I start? A: Starting with a tune-up will be a good idea; as mentioned above, in these GM V6 engines the high resistance in the ignition components can cause arcing that could in turn cause the electrical interference with the camshaft sensor signal. If the spark plugs and wires haven't been replaced for a long time, this could easily cause this code. Check the sensor's wiring and the connector for corrosion or loose connection. Also, it's worth to check the ground cable connection as this also can cause electrical problems.